ABI Research conducted a survey which revealed that 52% of all consumers will use mobile coupons if they have them available, when shopping at their favorite stores. Along with the surge in smartphone popularity and the consumer’s need to use it in a variety of tasks, the news couldn’t be better for companies who use text marketing, or those who are searching for better and bigger ways to build a large following of customers. Mobile coupons are the perfect way to attract a consumer into your store’s doors. 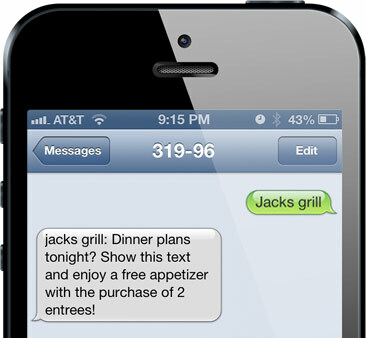 And, as technology and smartphone use continues to grow, sending them via text marketing programs is simple and easy. There are numerous reasons that the consumer prefers the mobile coupon versus the other types of coupons are available. It is far beyond the obvious reasons that we want coupons , like saving money. All of the benefits of a coupon right on their phone. What could be better? Take a look at the four key reasons that text marketing mobile coupons are the way to get your business to the next level. It is Convenient: Text messaging Is so easy. Anyone can do it. Anyone can open the message that is sent to them revealing the amazing coupon deal you’re offering. There’s no scissors required and no headaches either! Mobile coupons are desired by the consumer, and they’re far more likely to be redeemed. Relevant Offers: When you implement text marketing into your business plans you can create more personalized offers tailored to the exact needs of the consumer. This reduces your lost time and the customer’s as well while eliminating spam and headaches. Coupons that are relevant to their needs and desires are far more likely to be redeemed and this is something that text message marketing makes easy. Local Offers: What one location is offering may not necessarily be what the store 24 miles down the road is offering. So, when you send mobile coupons you can customize to the exact location of your choosing. This eliminates a lot of hard work for the consumer, and eliminates a lot of disappointment in the process, too. All about the Timing: One of the best things about text message marketing is you can pick and choose the times that you want to send the message. It is a proven fact that timing is everything when you’re marketing to a cell phone. Sending a 50% off coupon right before dinner is sure to create a response and a flood of people into your doors. Add that special to a slow night and you’re a winner! This is just one example of choosing the right timing, but it is safe to say this is an advantage that will grow on you more and more as you progress in your messaging.